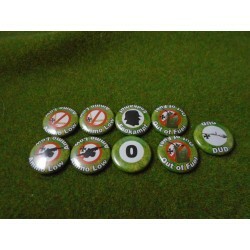 These 25mm round markers will quickly identify unit status making game play easier and quicker. They are made of metal with a plastic back. They are covered with a thin layer of mylar to protect them (this is non removable). Fully colored and ready to go out of the package. 1 marker that is in full color and are ready to go straight out of the bag. They measure in at approx. 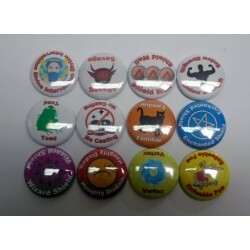 25mm in diameter and have a plastic backing. A complete set of 18 markers that are in full color and are ready to go straight out of the bag. 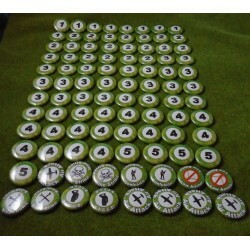 This set includes : 15 'pin markers' that measure in at approx. 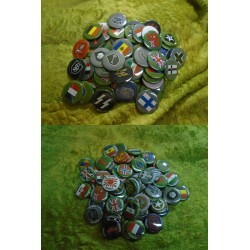 25mm in diameter and have a plastic backing. 3 Objective markers that measure in at approx. 40mm in diameter and have a metal backing. This is the complete set needed to play Battlegroup Kursk/Overlord miniatures game. 96 markers in total in full color and ready to go straight out of the package. They are approx 25mm in diameter and come with a thin protective mylar cover. This addition will allow you to play Battlegroup Fall of the Reich. 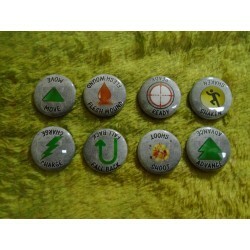 Please note that this is not a full set but an add on for the base set. 9 markers in total in full color and ready to go straight out of the package. They are approx 25mm in diameter and come with a thin protective mylar cover.